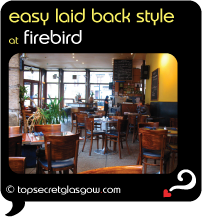 Maybe the coolest Gastro-pub in Glasgow, Firebird offers great European dishes, many baked in Glasgow's only wood burning stove. Using a wood-burning stove, the pizzas here are made to order, and baked to perfection. In a child-friendly dining space, parents with prams often drop in here, after a walk in Kelvingrove Park. The menu includes a wide range of sandwiches and salads, with plenty for vegetarians to pick from. Expect dishes with influences from Europe - lots of olives, cured meats and Italian style puddings. Add to this some tables on the pavement for the sunny weather, and its east to see why this place is such a local treasure. Nesting very close to Kevingrove Art Gallery and Museum, its ideal for both people watching, and reviving oneself after a walk in the park. There is always the chance of local musical talent to strum you through your visit. All in all this stylish cafe bar is a well-relaxed, quality venue. Great news! Finding this page means you can now join our VIP list for Firebird. Grab your very own web page all about Firebird. Do you have a special story about Firebird? A funny experience? A grand occasion? A funky photo? A personal tip? A top secret?